The photograph is of part of the Crescent in Buxton, an historic building and architectural masterpiece which has, amazingly, been allowed to fall into disrepair. 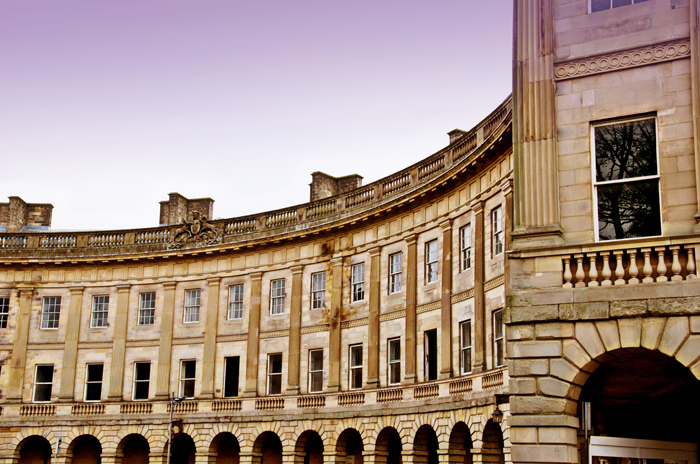 High in the Peak District, the elegant curved structure, which dates back to the 1780s, echoes the Royal Crescent in Bath. The years have, however, taken their toll and the building has corroded and fallen into disuse and disrepair. Past plans to restore it failed due to withdrawal of funds, following the disbanding of the East Midlands Development Agency in 2011. Derbyshire County Council has, however, now granted a loan to the developer to enable restoration to be completed, and works are expected to be concluded in 2016. When finished, the Crescent’s new life will be as a hotel and spa, but for some of us, what the building becomes is secondary to its survival as living history and a fabulous piece of inhabited sculpture.